Dubai-based investor Ali Albwardy has denied bribing Tanzania's President Jakaya Kikwete and donating $1m (£620,000) to his political party. A 2006 US diplomatic cable, published by whistleblower site Wikileaks, said Mr Albany flew Mr Kikwete to London and bought him designer suits. Mr Albwardy's company, which owns a hotel chain in Tanzania, dismissed the allegation as "totally untrue". Earlier, Mr Kikwete's office also denied the allegation. The cable, written by the former US Ambassador to Tanzania, Michael Retzer, said he had been told that Mr Kikwete's "flashy attire" had been sponsored by Mr Albwardy. The businessman flew Mr Kikwete to London on a "subsidised shopping expedition" and among the items he bought the president were five suits from upmarket Savile Row, said the cable. "Kikwete probably believes there is no harm in taking these little gifts to do what he would have been inclined to do anyway. That said, they are what they are: bribes," the cable alleged. It also said Mr Albwardy had made a $1m cash contribution to Tanzania's ruling Chama cha Mapinduzi (CCM) party, but the donation was legal. Albwardy Investment MD Philip d'Abo said Mr Albwardy denied giving Mr Kikwete anything that could be construed as a bribe. "At no time has Mr. Albwardy either paid for the airfare for the president to visit London or purchased even one suit for him from Savile Row. This is a total fabrication as is the part concerning the $1m donation to the CCM by Mr Albwardy," he said. On Monday, Mr Kiwete's spokesman Salva Rweyemamu dismissed the allegations in the cable as outrageous. "It is full of lies and innuendoes seeking to tarnish the good image and name of the president," said Mr Rweyemamu. Mr Albwardy owns three hotels in Tanzania - the Kilimanjaro Hotel in the commercial capital Dar es Salaam, a beach hotel in Zanzibar and a lodge in the Serengeti national park - through the company Albwardy Investment, reports Reuters news agency. 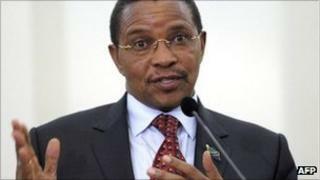 In May, donor countries cut funding pledges to Tanzania - which Mr Kikwete has governed since 2005 - after expressing concern about corruption and the slow pace of reforms. Can elections help Tanzania tackle corruption?